OKLAHOMA CITY (Sept. 12, 2017) – Meet a special brand of Oklahoma-centric curriculum – it’s a little bit country, a little bit rock and roll. First-grade teacher Heather Ozbun moved to the music as she cleaned up her workstation, where she and a partner smashed strawberries and used a multi-step approach with shampoo, salt and rubbing alcohol to isolate DNA strands. Back at Foyil Elementary, she plans to use the activity as a science and social studies lesson. She’s in her third year of teaching, and this is her first time to use ready-made lessons from Ag in the Classroom. Oklahoma Ag in the Classroom is a partnership among the Oklahoma State Department of Education (OSDE), Oklahoma Cooperative Extension Service at Oklahoma State University and Oklahoma Department of Agriculture, Food and Forestry. Program coordinators create hundreds of free lessons and activities that showcase Oklahoma livestock and specialty crops, along with other elements of the farming ecosystem. Ag in the Classroom lessons aren’t just for farm kids, according to Mary Lassiter, who used the program’s hands-on activities as her go-to lessons when she was a developmental education teacher at Pleasant Vale Elementary in the Pioneer-Pleasant Vale School district. “Some of our children are city-dwellers in Enid, but we have a pretty large group of farming people as well. So Ag in the Classroom was a great way to intermesh those groups that live totally different lifestyles, from the farmer’s child to the apartment dweller,” said Lassiter, who is now the school’s library media specialist. Even though her school is in a farming community, Lassiter said, the emergence of fast food means young children don’t necessarily know how food gets to their tables. “They’re surrounded by wheat fields and canola fields – we’re actually right out in the middle of the crop land. For them to realize what all that stuff was, that what was growing in their field was going to be their bread one day – Ag in the Classroom has so many activities that let you do that,” Lassiter said. Together with Judy Mullen, a fifth- and sixth-grade teacher at Pleasant Vale, Lassiter made a video vignette for Ag in the Classroom, in which their classes made red dirt tie-dye shirts to allow children to gain insight into the unique qualities of local soil and why some plants grow better in Oklahoma. Mullen said combining the Ag in the Classroom curriculum with a school garden has broadened students’ interest in trying new foods. In their garden, the children have grown lettuce, radishes, spinach, strawberries, and squash. “I took the squash home and made a squash casserole. The kids ate every bit of it. I don’t know if they would have tried the squash had they not grown it themselves,” Mullen said. Lassiter said her first-graders devoured the heirloom tomatoes they harvested from the garden before she could even get them back to the classroom. 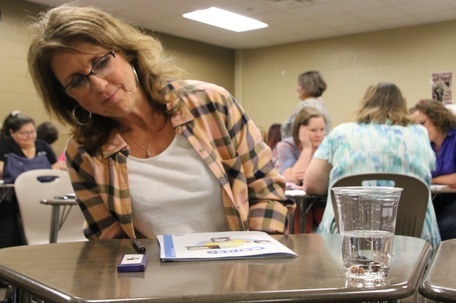 Teachers across Oklahoma are looking for ways to engage students and get them excited to come to school, said Audrey Harmon, one of three Ag in the Classroom coordinators who travel the state providing free professional development workshops. Harmon recently visited a first-grade classroom in Pryor, where students were engaged in a math lesson using cotton balls to count by 10's and observing cotton seeds growing in an indoor greenhouse. “Students were eager to tell me about the life cycle of a cotton plant, including the importance of pollinators, and also were telling me about sharing the information they are learning with their parents. The students weren’t only learning math but also science and language skills,” Harmon said. Oklahoma Ag in the Classroom lessons are unique because they address Oklahoma Academic Standards with meaningful, hands-on activities. Concepts are explained in simple language, so no agriculture background is needed, and each lesson is reviewed by the OSU Division of Agricultural Sciences and Natural Resources for accuracy. One lesson, “Asparagus: The Mighty Spear,” challenges children to learn while playing with their food. A vegetable often the object of suspicion and scorn transforms into a teaching tool to reinforce skills. Children compare standard and non-standard measurement using asparagus as a ruler, count syllables in its name, use it as a paintbrush, or grow it in the garden and discuss its life cycle. “This lesson is one of many that uses a food that children might be reluctant to try eating. However, after learning about its nutritional value, using it as a learning tool and becoming familiar with it, I have seen third-grade students ask for a second helping of grilled asparagus,” Harmon said. In addition to free resources on its website, Ag in the Classroom offers free classroom sets of magazines, and its newest teaching tool, made possible by a donation from Oklahoma AgCredit, are financial literacy cards for elementary and high school. When educators attend professional development workshops, either at their schools or at a state conference such as OSDE’s EngageOK summer education conference, they are eligible to apply for a grant from the Oklahoma Pork Council for up to $300 to teach Ag in the Classroom lessons in their classrooms. The spring deadline for the grant is Jan. 30. Amber Bales says she’s not a typical farm girl like many in Morrison, a small town north of Stillwater. But the third-grade teacher started attending free Ag in the Classroom workshops across the state and brought her ideas back to Morrison Elementary. Bales’ unit on buffaloes started as a student-led research assignment and ended up as a project for the county fair – but with a twist. Bales incorporates technology into her Ag in the Classroom lessons. Her students went a step further by making their homemade buffalo board “talk” by recording facts into the voice app Chatterpix and creating a multimedia presentation. In 2016, Bales was named Oklahoma’s Ag in the Classroom Teacher of the Year. She was one of eight teachers to receive the National Excellence in Teaching About Agriculture Award for 2017. “We just talk every day that when you get up in the morning and put on your clothes, you need to think of farmers. Our clothes are from cotton. When you eat, you need to think of farmers because where did that food come from? It doesn’t matter where you live, you are utilizing agriculture, and even living in a rural place, students still sometimes forget that,” Bales said. The current Oklahoma Ag in the Classroom Teacher of the Year, Debra Deskin, was raised on a farm with cattle and horses in Luther but is surrounded by city kids every day. She said they are constantly asking for their next ag lesson. Deskin teaches gifted and talented enrichment classes at two elementary schools in Edmond Public Schools. Deskin said she hasn’t converted every teacher in her schools to Ag in the Classroom yet, but she believes agriculture is relevant for all Oklahoma teachers. Ag in the Classroom lessons are available for all subject areas in grades pre-K through 12. Lessons and online resources, along with the contact information to schedule a workshop, can be found at www.agclassroom.org/ok. Annette Price is communications and constituent services specialist at the Oklahoma State Department of Education. First-grade teacher Heather Ozbun of Foyil uses a dropper to isolate DNA strands from a strawberry at an Ag in the Classroom workshop in Oklahoma City. 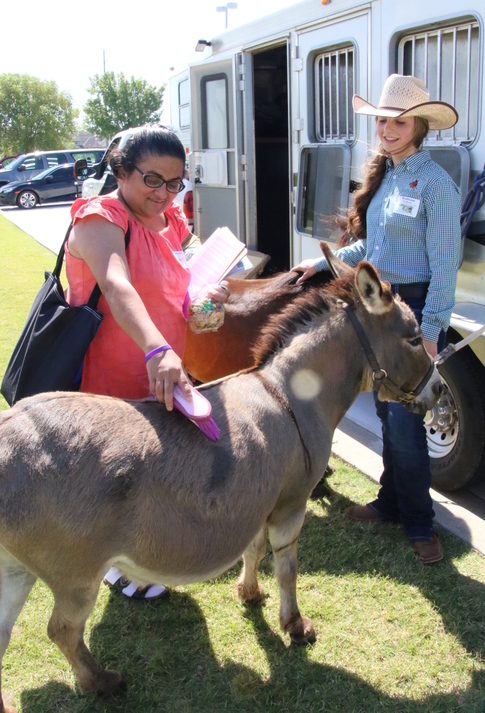 Anupama Gowda, a school nurse at Central Junior High and Central High School in Tulsa, brushes a donkey at an Ag in the Classroom workshop at Moore-Norman Technology Center in Oklahoma City. 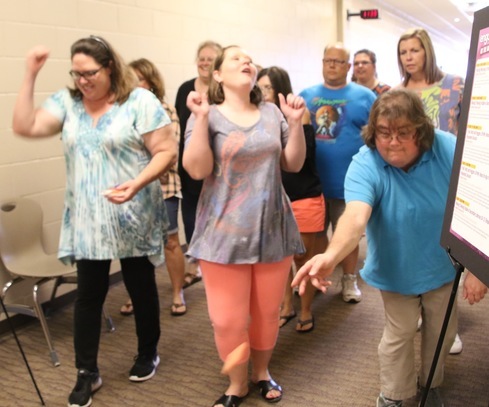 Teachers line up to participate in a spelling contest/carrot toss at an Ag in the Classroom workshop at the EngageOK summer education conference at Yukon High School. 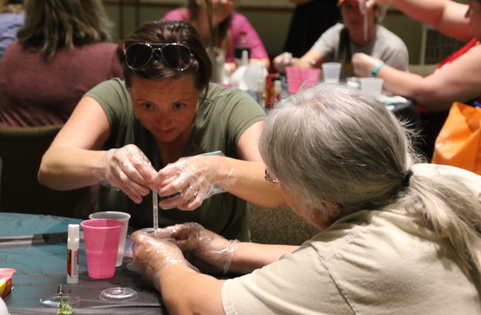 Teachers conduct a science experiment, “Dancing Blueberries,” with raisins, dried blueberries, and clear soda at an Ag in the Classroom workshop at the EngageOK summer education conference at Yukon High School. Oklahoma Ag in the Classroom Teacher of the Year, Debra Deskin, of Edmond.